Online flower delivery companies have proved to be too much competition for the independent florist industry, whose profit margins have wilted over the last five years to 2017. It’s not only web-based traders offering customers bargain prices and convenience, supermarkets import cheap stock from countries such as Columbia and Ecuador that puts price pressure on high street florists, which is bruising their bottom line. Forecasts predict the forthcoming five years will continue to show a decline in revenue for store-based florists, so, for those entrepreneurs who are keen to set up shop, you must go in with your eyes wide open. Before you blossom in the floral industry, you should know some facts and statistics about the trade in Canada. Since 2009, the industry has been in steep decline. Annual growth in the florist sector from 2012 to 2017 was -4.8%. Arranged cut flowers - the industry’s bestselling product category - account for 62% of total revenue. There are approximately 3,180 florists operating across Canada, and around 5,990 employees working in the trade. The net revenue of the florist retail is $546m, with revenues forecast to decline. Most SMEs in the industry make an average revenue of $273,000, with 72% of florists remaining profitable. Almost a third of all cut flowers sold in Canada are imported from Colombia, which is the biggest supplier in Canada’s flower sector. In 2010, Canada imported $23.5m worth of roses from Colombia as well as $14.1m worth of carnations and $9.6m worth of chrysanthemums. The 2010 Free Trade Agreement between the two countries eliminated the tariffs on Colombian flowers, which increased imports and cut out local Canadian rose growers from the industry. Over the years, competition from supermarkets and e-retailers would have forced some struggling florists to fold, however, buying a business in administration means you can buy a business at a reduced price. However, you need to act quickly if you’re buying a bust business; due diligence checks and legal processes may need to be put aside. You can use the risks associated with buying a failing business as leverage when making an offer. You should also make a physical inspection of the business assets, as the information in sales particulars may not be guaranteed. You should also factor the costs involved in revamping and rebranding the business, make sure you have a viable plan and budget in place before making your bid. You should also consider the cost of advertising your new business if you want customers to know that the business is under new management. Advertising in local newspapers and radio stations is a good way to spread the word. There are some budding entrepreneurs who are differentiating themselves by offering price premium, creative floral arrangements using locally grown flowers. It is possible to compete with competitively-priced online products and conveniently-placed supermarket competitors if you offer a personal and unique service and tap into the luxurious, boutique floristry market. Many successful florists have branched out into arrangements for events and weddings, which is a very profitable industry. A 2015 poll found that the average Canadian spends $30,710 on a wedding, with flower arrangements one of the top priorities for brides across the country. Another advantage of the events industry is that it has steady consumer interest all year round with dates such as Valentine’s Day spiking up sales. 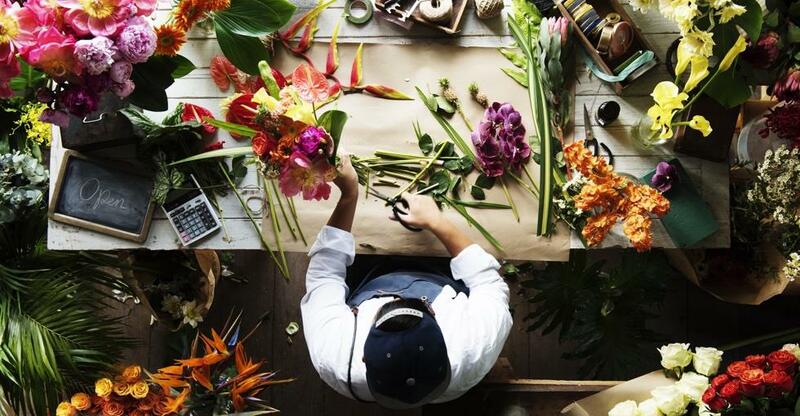 Carving a niche for your florist business is essential if you’re going to survive in the industry, and there are many different ways you can do this. For those entrepreneurs who are understandably hesitant to buy a business premise, why not try running a florist business from home first. Flower delivery can be a great home-based business, and building up a customer base could give you the confidence and experience you need to buy a florist business and make it your own. Stock doesn’t stay fresh for long, so depending on the area and footfall, you don’t need a large retail space, making florists comparatively cheaper to buy than other businesses. You should also consider the store’s reputation within the area; if it’s bad, factor the cost involved in rebranding and making the new business a success. Location and footfall is another important factor when buying any retail business; large window displays decorated with floral arrangements and bouquets are the most effective way to entice customers into your store. Look for a premise that has good high street presence and check to see what other potential competitors are in the area, which could include supermarkets and convenient stores selling flowers nearby. You should also consider what assets are included in the sale price and inspect any equipment listed in the inventory. You should inspect floral coolers as this equipment is critical in keeping stock fresh for longer. Determine what condition all appliances and equipment are in and assess whether any repairs or replacements are needed; you should factor these costs before you submit your offer.